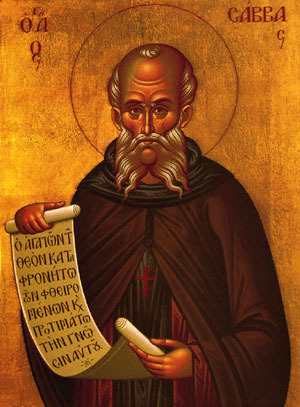 O blessed Sabbas, thou wast offered from thine infancy through thy great virtue as a pure and spotless sacrifice unto God, Who ere thy birth, verily foreknew thee; wherefore thou wast an adornment of the righteous Saints, an all-praised founder of cities in the wilderness. Hence, I cry to thee: Rejoice, O Father of great renown. Share the feast of Sabbas the Sanctified with an icon greeting ecard.